I took four years of Spanish during my school years, though you wouldn’t know it if you tried to have a conversation with me in Spanish. My experience is not unusual. The way language is typically taught in the U.S. often does not result in language acquisition. I wonder if things might have been different had I been a student today, in a time when technology provides such terrific resources for learning languages. Here are five free digital resources that can support students in language acquisition. 1. 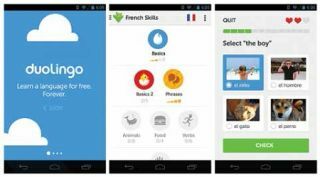 Duolingo has become a popular app to support foreign language learning. Its gamification elements make it both fun and addictive. You can earn points for correct answers, race against the clock, and level up. The bite-sized lessons are effective, and here is proof that it works: more than 100,000 classrooms are using Duolingo. Teachers can easily track their students’ progress, run in-class activities, and assign homework. 2. Livemocha’s site explains that language is not just an academic subject but also a performing art—something that students must actively practice in order to master it. A learner can listen to people speaking a new language, memorize all of the grammar rules, and talk about the language ad nauseam. But to truly master a language, a learner must actually practice speaking it with a partner. Conversational fluency requires good instruction, a dose of courage, and a lot of real-life practice. Livemocha’s methodology is structured around the Whole-Part-Whole learning model, a proven framework that allows learners to observe, learn, and then practice new language concepts. Livemocha is available to students of all ages. Children under 13 must have written authorization from a school or other educational organization that registers them. 3. Dotsub: Subtitles are great for both increasing literacy in a native language and for learning other languages. Citizens of Scandinavian countries are renowned for their terrific English language acquisition, and this is often credited to the fact that they grow up with subtitled English television and so have plentiful exposure to the language. Dotsub is a digital resource that capitalizes on the power of subtitles. It is a browser-based, one-stop, self-contained system for creating and viewing video subtitles in multiple languages across all platforms, including Web-based, mobile devices, and transcription and video editing systems. It’s easy to use, there’s nothing to buy or download, and it’s fun. You can upload your videos, transcribe and time-caption them, translate them into and from any language, and share them with the world. Dotsub enables students not only to watch videos with subtitles in various languages but also to create the subtitles. The videos are translated in either a totally open “wiki” type of environment or closed with password-protected permissions, allowing video “owners” to decide who can view, transcribe, or translate their videos. 4. MovieStarPlanet is a social Web site (blending elements of Facebook and YouTube) where children and teens work together with friends to create cartoons. Users practice and improve their English skills by creating cartoons in a fun and innovative environment. This virtual world for students has been developed in collaboration with researchers from the Danish University of Education and a number of Danish elementary school teachers. The Danish Ministry of Science, Technology, and Innovation has supported it financially, and MovieStarPlanet is part of a research and development project dedicated to games in education, entitled Serious Games for a Global Marketplace. MovieStarPlanet is also available in 16 different languages, including German, French, and Spanish. 5. Online translation tools also provide interesting opportunities for language acquisition. For example, a language learner can Tweet, post, chat, or write an article and use a translation tool to convert it to another language quickly. The learner must then figure out if the translation is accurate and revise it so that it is. This exercise has the added benefit of enabling the learner to connect with those who speak other languages and also to learn information from other cultural contexts. It is also useful to see language translated in real time. Visit Wikipedia in another language to learn about an historical event. Of course, the student will need to figure out first what that event is called in that language. For example, in Spain they refer to the Spanish-American War as “La guerra hispano-estadounidense.” A student can read about it in Spanish and can also translate it into English for instant tutoring assistance. By hovering over any passage learners can see it in their native or new language. Anyone using this tool can also contribute to better translations. I used translation tools to communicate with Arif Hidayat. Arif was working on his English, and using translation tools to communicate with me via chat helped to improve his English. We used Google Docs to write a collaborative article. I provided guidance and support on proper use of English, and in the end we created something we could share with the world. I’ve also had the pleasure of chatting with parents of students who speak different languages, using Google Translate. Not only does this tool provide live translation, but it will also speak the language. Technology provides amazing ways for us to acquire new languages and to communicate with and understand people from other countries. The possibilities are exciting. Which of these resources have you tried, or might you try, with your students? What have you found to be effective, or what do you feel would help your students get excited about learning a new language?